Do a bit of thinking and figure out what is making you feel stressed and why. It may help to talk this through with friends or family. Once you know what triggers your feelings of stress, you can look at changing your behavior or putting into place tricks to help you reduce it. Meeting your friends to have fun, reading a book, watching a film; whatever it is, make sure you don’t neglect it as it will help you feel more relaxed. A balanced diet with lots of fresh fruit and vegetables will help strengthen your immune system. You might like to read our blog on eating well on a budget. As it helps your body produce endorphins. Endorphins make you feel good! It will also help you clear your thoughts, so you will be able to think more calmly, and will help you sleep better. Why not go for a brisk 30-minute walk? Or explore the University’s Sport Services ? They have a fitness centre, a strength and conditioning centre, and offer a wide variety of classes – you’re bound to find something you like! Some people find a quick 20-minute nap helps increase productivity. So, turn your phone on silent, shut your laptop – and have a snooze. Each programme consists of modules to be completed in your own time and at your own pace over approximately 8 weeks. The modules contain text, video and audio clips, as well as activities and quizzes that you can complete as you go along. If you’ve tried some of these self-help techniques and they are not working for you, please do go and see your GP. 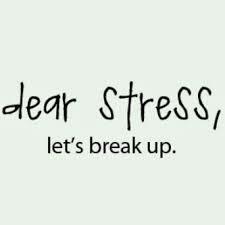 Sometimes stress can cause health problems, so it is important to have a health professional check you over. They may suggest other techniques for you to try, or recommend other forms of support.